This soup was so delicious that it has become our go-to potato soup. It was easy to make, but you probably don't want to try and rush it, as peeling fresh from the oven potatoes isn't the smartest idea. Also when you get to the garnishing step I felt as if there were not enough scallions and cheese but a little too much bacon. If you agree with me you may want to get some additional of the first two and less of the bacon. batch just thinking about how good it tasted! Pierce the potatoes multiple times with a fork and then bake for an hour. Let the potatoes cool and peel them. Dice 3 of the potatoes and mash the 4th one. Melt the stick of butter in a pot over medium-low heat. Whisk in the flour until smooth. Gradually whisk in the milk. Cook the mixture for about 10 minutes. Add the potatoes, 3/4 cup of cheddar cheese, salt, garlic powder, and pepper. Remove the pot from heat and stir in the sour cream and 1/2 cup of scallions. Put the pot over low heat and cook just until hot, but do not boil. 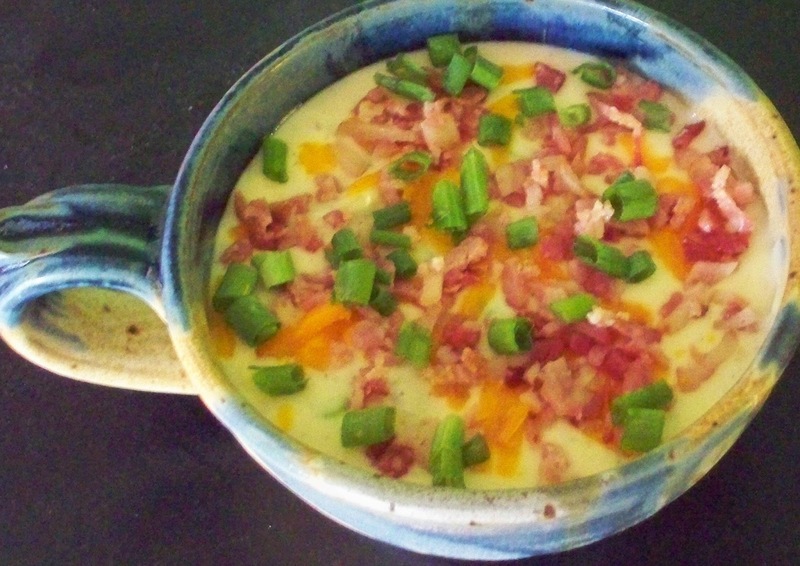 When serving garnish with remaining cheese, remaining scallions and crumbled bacon.